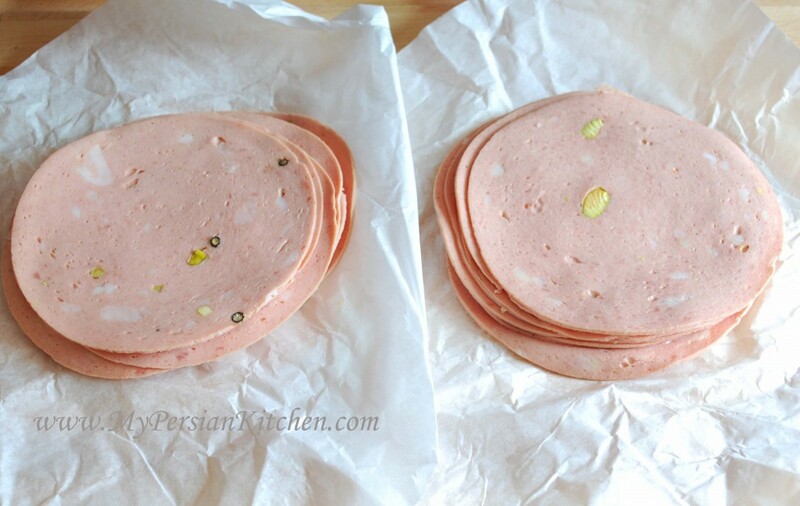 It’s practicably impossible for me to talk about Kalbas and not talk about Amoo Manuchehr, the person who introduced me to Persian Mortadella! 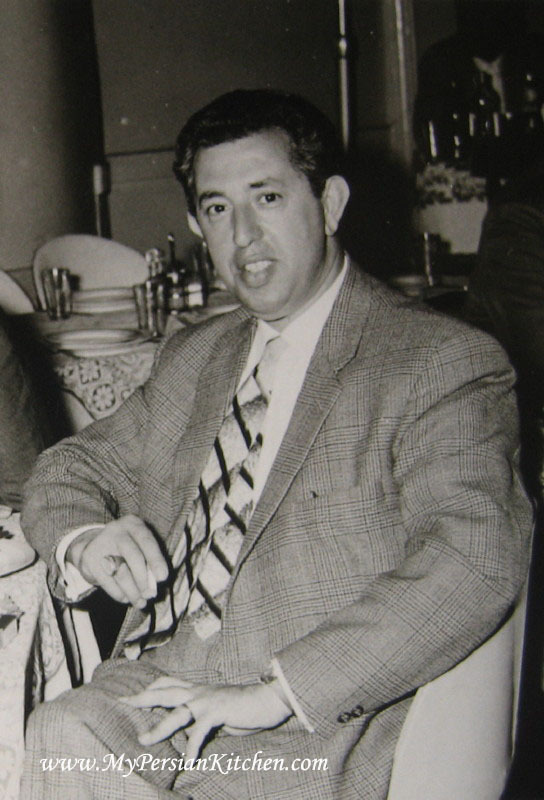 Amoo Manuchehr was one of my maternal grandmother’s first cousins. Both my mom and I grew up calling him amoo, uncle in Farsi. My mom’s side of the family is made of this really interesting combination of characters. Some are extroverted, jovial, and total jokesters; while others are extremely serious. Out of all of Amoo Manuhcher’s siblings that I have met, it is safe to say that he was the most fun to be around because of his cheerful persona, in fact he always had smile on his face. I should also say that from a child’s point of view, what also made him so special was the fact that he always engaged with us kids and played with us. There are quite a few of us in our family who considered him our favorite uncle. My mom loved him and needless to say so did I, a lot! Amoo Manuchehr often came to visit us in Tehran from Tabriz, the city in the north west portion of Iran where all of my mother’s side of the family is from. He always stayed with us at Maman Fakhri’s house. I always looked forward to his visits and we had a great time when he came over. In retrospect I am amazed and in awe of the person that he put forth during those days. The first few years of the Iranian revolution were hard on everyone; not only had the regime changed, but we also found ourselves in the middle of a war. Amoo Manuchehr had plenty to be bitter about in life as he had lost a lot in the transition of governments. However the greatest loss to him was the fact that he was not allowed to leave Iran because his passport had been confiscated by the new regime. What made it unbearable for him was the fact that he was married to a lovely Swiss lady. At the time of the revolution she had been abroad with their three children. He missed his family immensely and he often spoke fondly of his children. Sadly, he passed away in 1990 without having the chance to see his wife and children for over a decade. Amoo Manuchehr left a huge void in our lives and hearts. His youngest son Mahyar, the same one who has been cooking my recipes and sending me the pictures, recently came for a visit to Los Angeles. Seeing him after decades was wonderful. There is something truly beautiful, yet nostalgic, about the uncanny resemblance that a son bears to his father. I was amazed at how much Mahyar’s profile is just like his father’s. But what was even more heartwarming was the fact that his personality is just as warm and “bubbly” as his father’s. 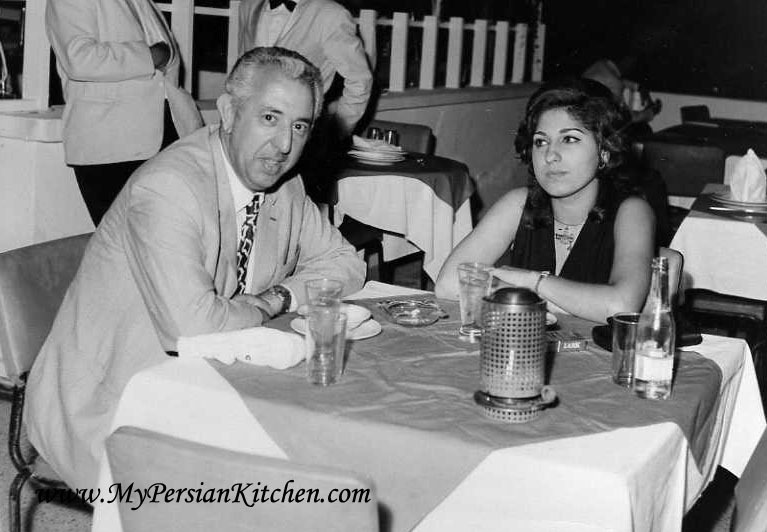 Now back to Kalbas, sometimes Amoo Manuchehr would take me along when he went out; one time he took me on an unforgettable culinary adventure. We drove to a neighborhood that I had not been there before and we went into a market. There was some lowering of voices and some winking. He told the man behind the counter that he was there to get some of the “special.” Special Kalbas? What was going on? Low and behold the special Kalbas was not the Halal kind, but it was made with pork. Mind you, this memory is from the early 80s during the very first post revolution years, so having anything that had pork in it was not permitted, at all! Amoo Manuchehr then picked up some tomatoes, Persian pickles, and bread. Off we went home and had the most delicious meal! Needless to say that every time I eat Kalbas I think of him. 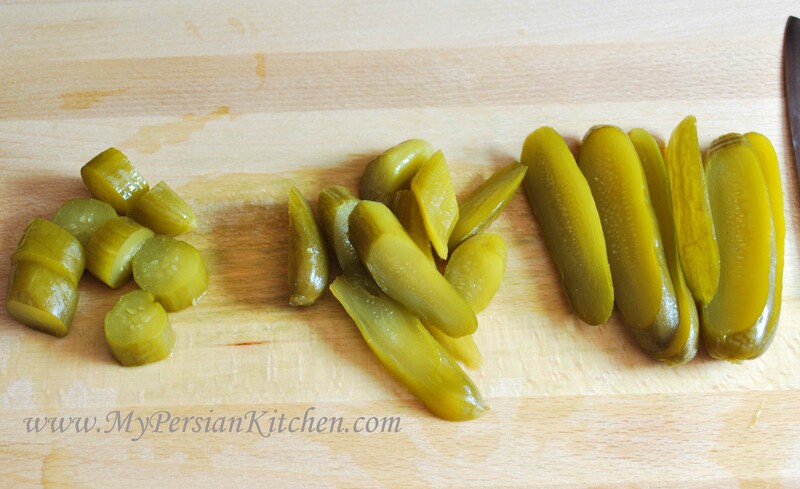 At the Persian markets there are usually three different types of Kalbas. The two lighter colored ones are made with pork. One has more garlic than the other. The one on the right, which is darker in color is the Halal kind. I love love love Kalbas. 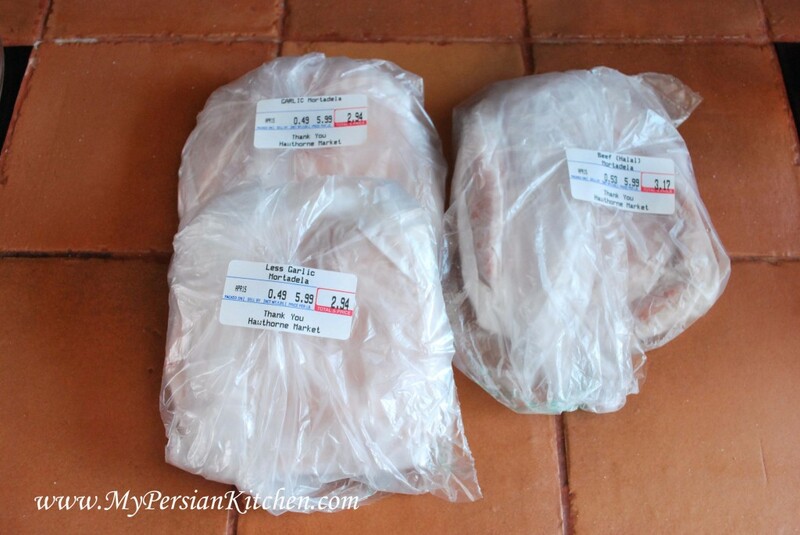 When you purchase them from the Persian store, they always wrap the slices in a bag. The smell of garlic can be pretty strong! Here are the three types that I purchased. Isn’t this an appetizing platter??!! This is a meal in itself! However, it can also be delicious appetizer to serve to your guests! 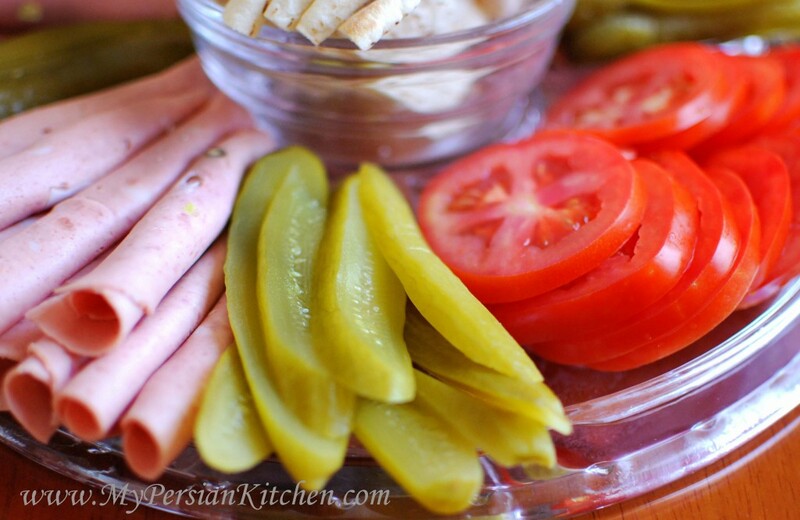 To serve Kalbas all you need is some sliced tomatoes, sliced Persian Pickles, and bread. It’s up to you how you want your pickles to be sliced. I usually like them sliced vertically. It’s also up to you what type of Persian bread you want to serve with it. On the day that I made this platter I chose Pita bread. 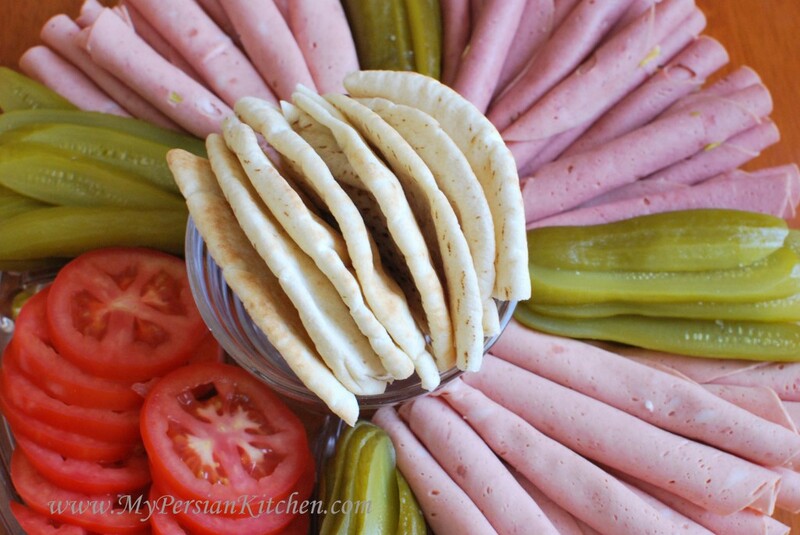 I sliced each pita round in quarters for easy made sandwiches. The best part is the eating part! Make a bundle and eat away. Now you can also add some Sabzi, Persian herbs to the mix too! Thank you so much for what you have written about my father, you made me cry. Love you too Mahyar!! Keep cooking and sending me your pictures!!! What a beautiful memory. You always have a way of showing the good and happy side of even sad things. It’s one of your many gifts. I loved this, and even though I’m a vegetarian now, I just got a little bit of a craving for a kalbas sandwich. Mmmm. Zahra, thank you for your sweet words. The “subjects” that I talk about make it easy for me. They are all awesome! Wow! My Dad used to make Kalbas sandwiches for me! We would walk together (Dast e dast. And please pardon if my Farsi is not quite correct; it’s been many years.) to the corner bakery and buy Barbari bread for our sandwich party. Like your Amoo, my Dad was from Tabriz as well. Thank you for knocking my mind back with all of these fond memories. My Dad would insist that the Kalbas sandwiches be eaten with pickles. The briny acid from the pickles would help to cut the fat from the meat. He was right. Tomatoes were aways served on the side, along with greens and radishes. Seemingly a strange combination, but it worked. I love it to this day. Keep up the good work with this site. Your pictures and recipes are lovely. Excellent Idea! Excellent web design! Excellent memories! Very nice. I can smell the gralic on the “special” kalbas!! Yum yum! 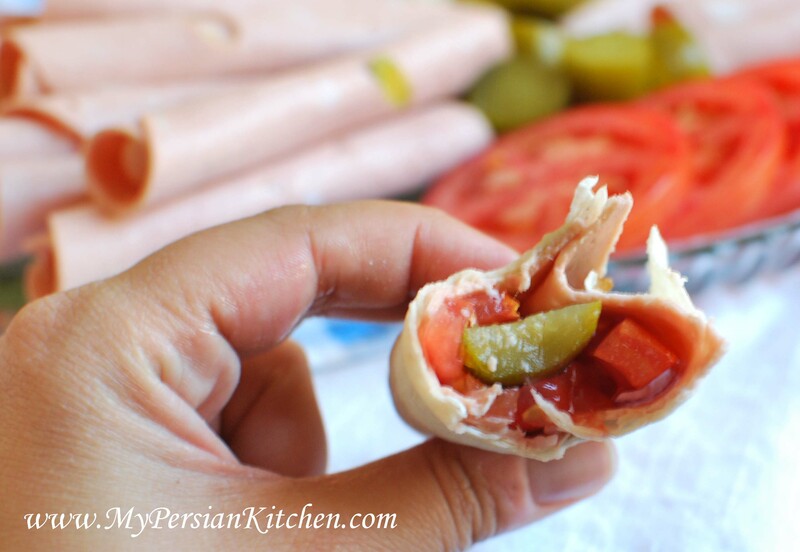 Sometimes for parties I use lavash, add a thin layer of mayo (even though the stuff is so fatty already but it adds another dimension) the pickles, tomato and some basil. Roll it up and slice into 1″ bites and you have an easy finger food. What a platter, azizam ! You bring back memories of the two famous(pre-revolution period) stores in Tehran, Arzuman and Mikaelian, but also sandewicheh kalbas from Madame’s store near Jeanne d’Arc school. I always find the local kosher cold cuts missing something, you are right it’s the garlic ! At parties there was also aragh saghi, apparently a very strong kind of armenian vodka. BTW did you get my email about guyava ? Vivi khanoom, thank you for your comment. I am going to ask my mom about the places you mentioned! I did get your email and will respond shortly. You made me giggle!!! 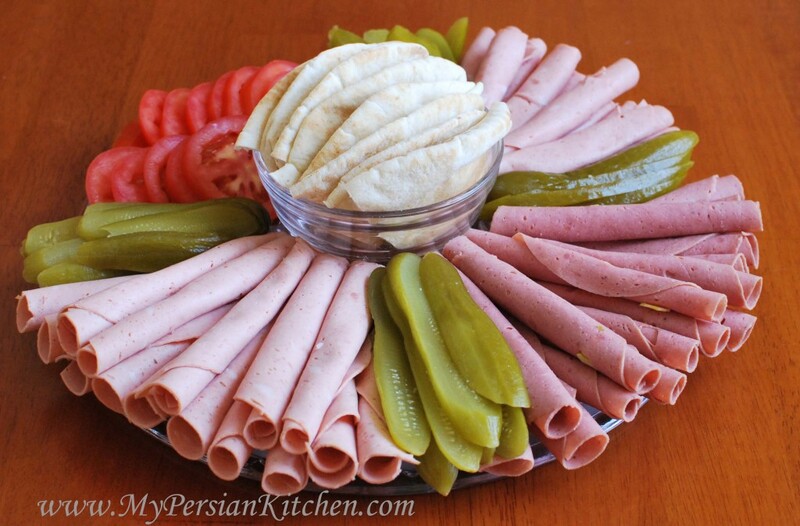 What a wonderful story and I agree that Persian appetizers are among the best there is. Just awesome. 5. Add a layer of sliced, ripe beef tomatoes…. 6. A pinch of black pepper…. 8. Wrap in grease proof paper……and enjoy!! Please put facebook link in order to make it easy for people to post the link of your articles to facebook. Kamran, there is a facebook icon at the bottom of each post along with twitter and other social media icons! Now I see where your passion for cooking comes from. Like you my mother’s side of the family is from Tabriz, and I must say they are one of the best cooks in Iran. Pooneh, OH MY! I am going to have to give it a try! Shina, thank you! Keep cooking!!! I loved this article.. I used to live in Ahvaz in the 70’s and we used to buy kalbas sanwiches from an armenian shop. They were made with long sour dough rolls (hotdog shaped) and, although it’s sounds horrible, they had a slight ‘naft’ taste from the oven they where baked. We loved our Kalbas rolls, served wrapped in a little grease proof paper. I remember the lovely tomatoey flavour and the exquist torshi… mmmmm. I still make them at home with italian mortadella but i miss the perfume of the naft! 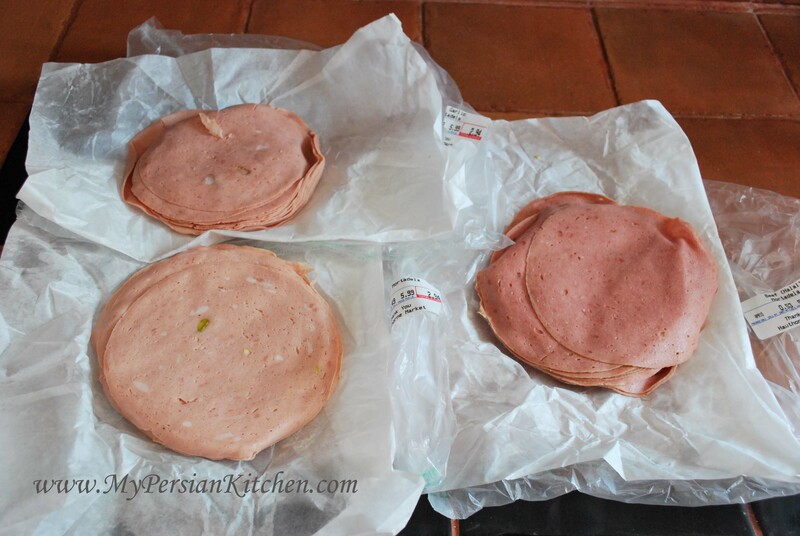 My boyfriend is Iranian he loves persian mortadella. We live in NYC and having a had time finding them in the store. can recommend a place to order them online? Amy, I don’t know where you can order kalbas online, but since there is a large Persian community in NYC, you should be able to find them at the Persian stores. I remember we were going to a ‘kalbas’ place in Tehran called Andre. There theay would sell the best sandwiches I had in my life. I wonder if that place exists. JUST SIMPLY WONDERFUL THANK YOU.